This entry was posted in 広報誌 2019年, 新着 広報誌 on 2019年4月11日 by いわき経済同友会　管理者. This entry was posted in 広報誌 2019年, 新着 広報誌 on 2019年3月6日 by いわき経済同友会　管理者. This entry was posted in 広報誌 2019年, 新着 広報誌 on 2019年1月30日 by いわき経済同友会　管理者. This entry was posted in 広報誌 2018年, 新着 広報誌 on 2018年12月28日 by いわき経済同友会　管理者. This entry was posted in 広報誌 2018年, 新着 広報誌 on 2018年12月7日 by いわき経済同友会　管理者. This entry was posted in 広報誌 2018年, 新着 広報誌 on 2018年11月12日 by いわき経済同友会　管理者. This entry was posted in 広報誌 2018年, 新着 広報誌 on 2018年10月5日 by いわき経済同友会　管理者. This entry was posted in 広報誌 2018年, 新着 広報誌 on 2018年9月6日 by いわき経済同友会　管理者. 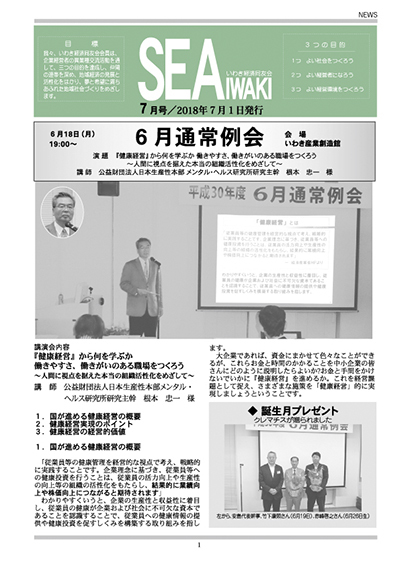 This entry was posted in 広報誌 2018年, 新着 広報誌 on 2018年8月9日 by いわき経済同友会　管理者. This entry was posted in いわきの特産, 広報誌 2018年, 新着 広報誌 on 2018年7月5日 by いわき経済同友会　管理者.